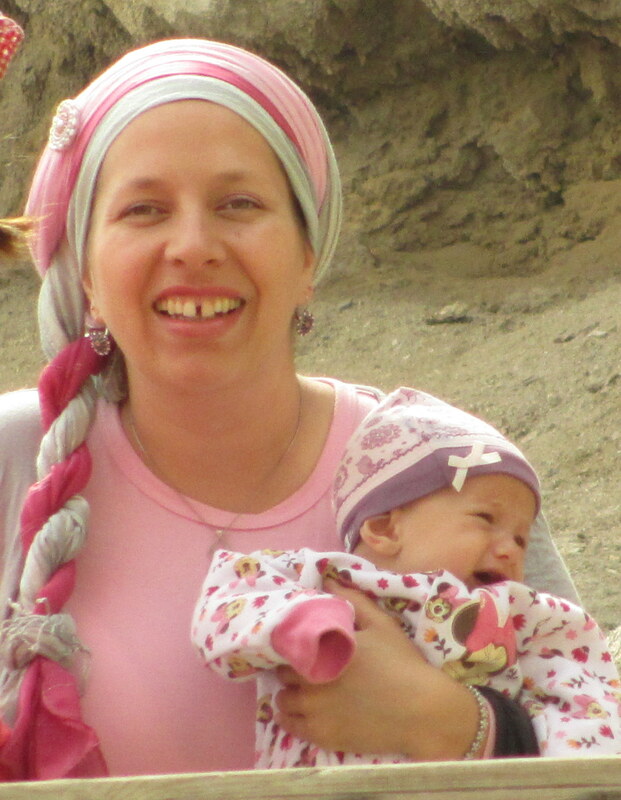 Meet this week’s lady wrap star, Batsheva. Batsheva hails from the beautiful land of Israel, and has some very unique insights about hair covering to share! She welcomes any questions we might have about her post, and will answer all comments! Hi! What do people usually call you? My name is Batsheva Tova. I use my middle name often, but most people call me Batsheva. There is quite a story behind it. My father fought in the 1982 Lebanon war and lost 7 of his friends. When I was born in October ’83, he named me after them (sheva=seven in Hebrew). I have been covering since I got married, 8 1/2 years ago. My mother covers her hair, so I always knew I would too. What kind of climate do you live in? How has this affected how you cover? I live in the beautiful Golan Heights in the north of Israel (y’all are welcome to visi!) The winters here are quite cold in local terms, and I tend to wear more ostentatious arrangements in the winter. Summers are boiling hot and therefore minimalistic. Have you always covered your hair with scarves? Mostly scarves. I had a couple of hats when I got married, but they didn’t last long. When I am not in the mood, I wear berettes. 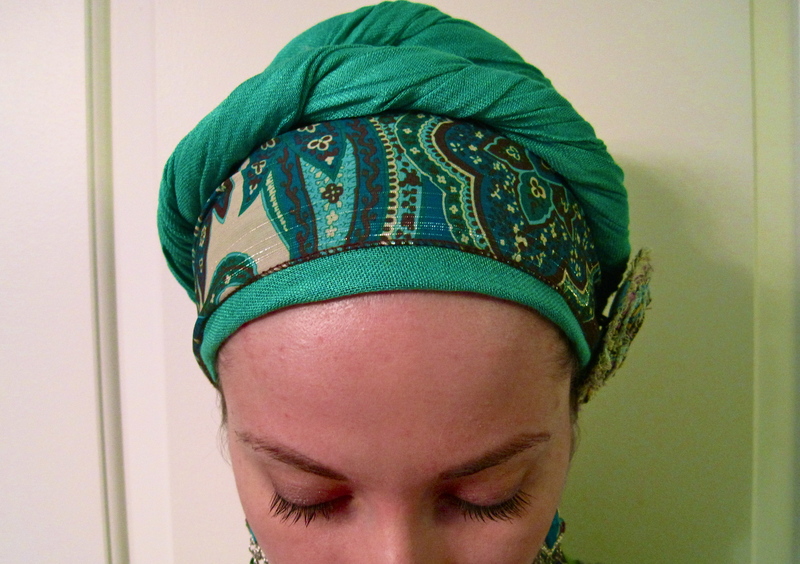 Have you changed how you cover your hair over time? Oh, yes. When I was newly married, the tichels and the way to wear them were very different. The tichels were all made of thickish cotton, and were monochromatic. No patterns, unless a gradual hue counts.We used to tie them in various “Rachel Imenu” styles; We wore square-triangles and we switched the ends behind our head and across the forhead. Some took one end under the hair and the other one over it. We sometimes did it with two tichels, one was the cap on top and the other one went around it. If anyone ties them this way today, they look very dated. When the scarves first came out, we use to tie them in a special way too, creating a kind of sack holding our hair and going above it. There were other covers too. There was a time when women wore small hats and wrapped their hair in black fabric like a black snake down their back. I saw a woman doing that the other day and thought:”Boy, we were peculiar”. Today, many women here wear “designed” tichels which are sewn from several fabrics with laces and decorations on them. They cost at least four times the price of a plain scarf. Back when I started wearing them, there were only square-folded-into-triangle type tichels. I must sound like a tichelosaurus. 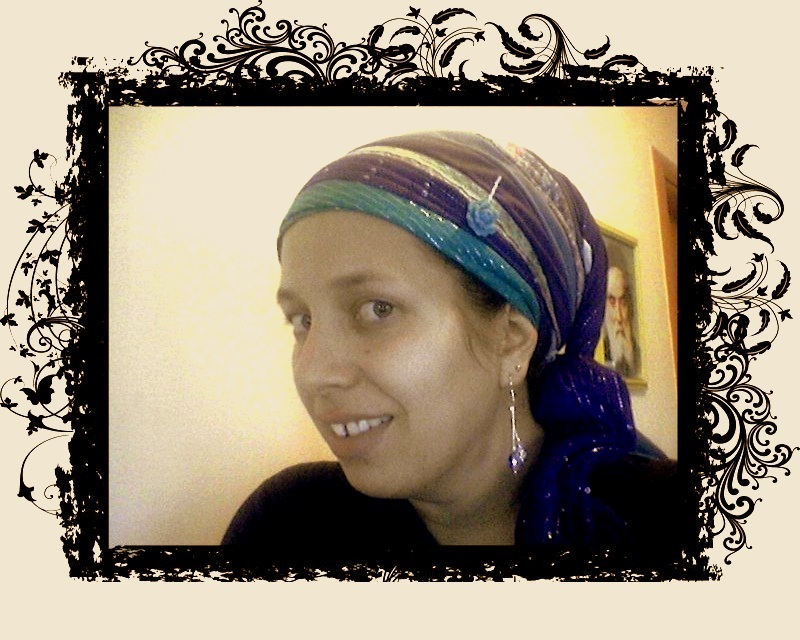 If you ever do a retro-tichel post, I would be happy to demonstrate! Can you share with us some advice about the technique of hair covering? I always wear a tricot (tshirt material) triangle tichel under anything I put on. It prevents slippage and gives a nice smooth shape to my head. 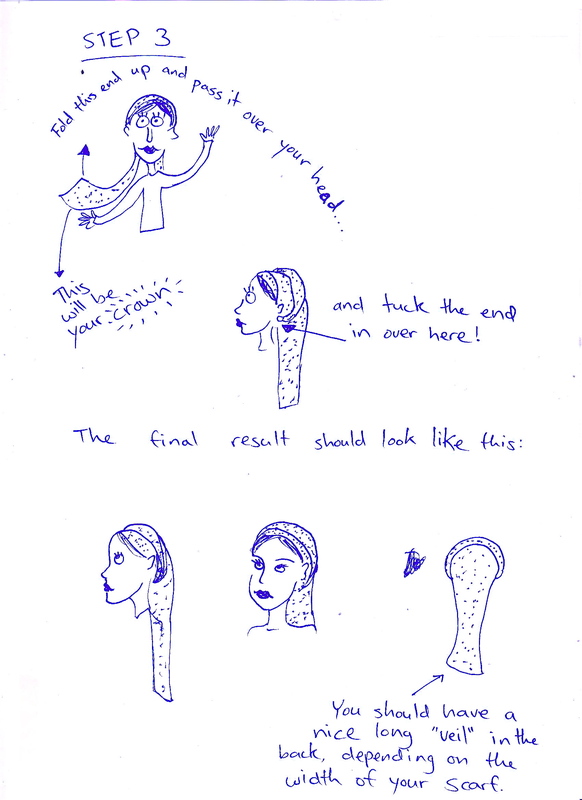 What is the most important thing you have learned/realized from covering your hair? Honesly? To always be comfortable. The rest doesn’t matter. And also to follow your belief. 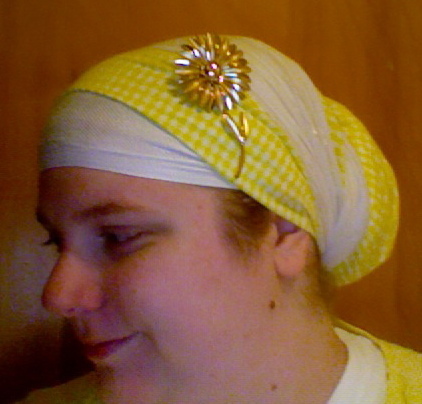 I believe that I should cover all of my hair, even though around me most women do the ponytail-out look. 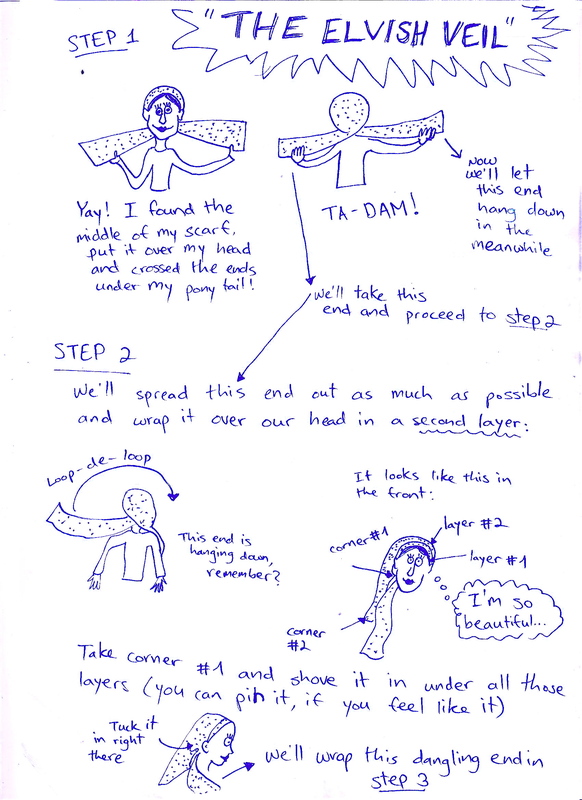 How did you figure out how to wrap your scarves so beautifully? A LOT of trial and error,and also jealousy of my sister. She has only been married for 9 months and is already a Ph.D. level tichelist. 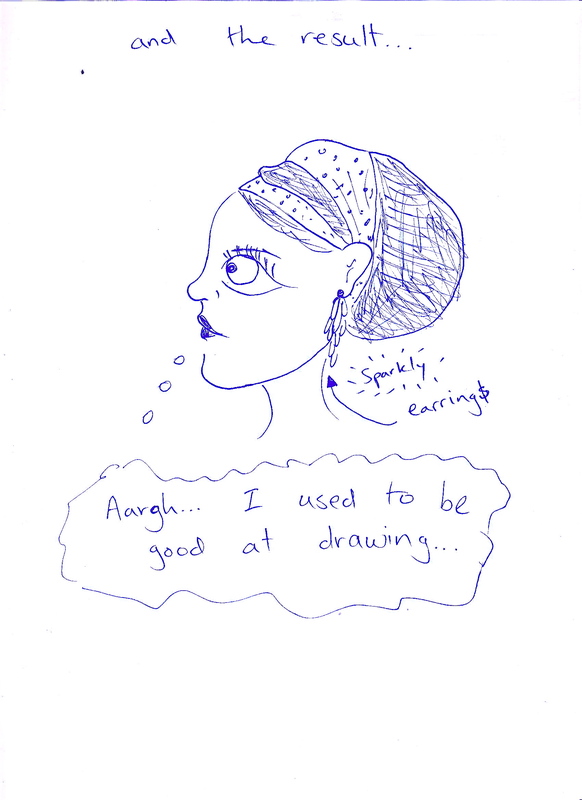 And obviously this site and Rivka-Malka’s one have inspired me. How do you wash/care for your scarves? Most of them are hand-wash only. I also fold them an extra fold in the front so they stretch a little less over my forehead. 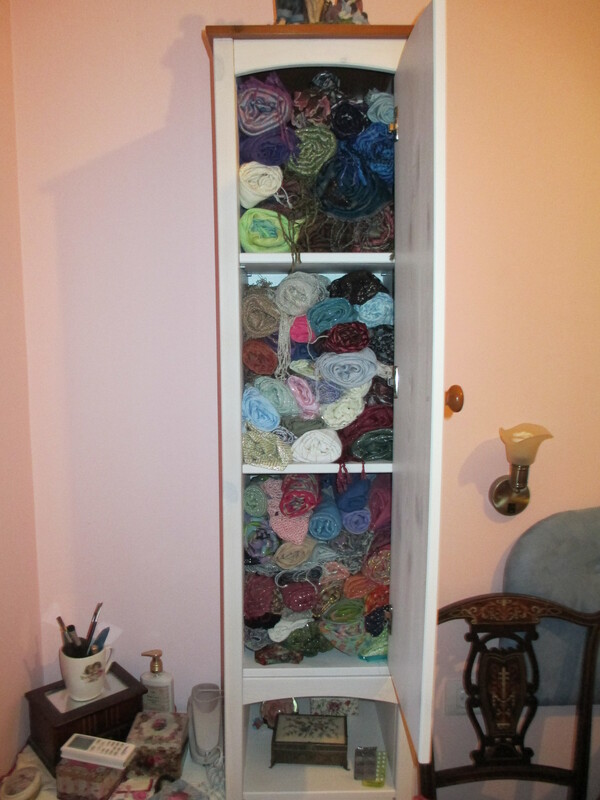 I included a photograph of the AMAZING tichel cupboard my husband got me for my birthday. The drawers underneath store my pins, brooches, lace ribbons etc. What are some of your recommendations that you would give someone with your hair type, face shape, colouring etc.? I am quite pale, but lucky enough to be olivish toned. Most colours look good on me. The only colour that I should really keep away from my face is black. I don’t like black, so this is rarely an issue for me. In my experience, black tichels make pale women look sick and swallow up the dark-skinned ones. My face is roundish and quite full, so I like volume in my tichels. If there isn’t enough volume, I feel I look like a balloon, or a bald person! My hair has nothing unique about it, just a wavy brown. I do recommend keeping it long – it helps holding up the whole thing. I know a girl with very frizzy long hair, and she doesn’t need a volumizer or an extra scarf or anything – if some of you disliked your frizzy hair, you’ll have a lot of fun when you start covering. For extra volume I use big velvet scrunchies on myhair, and also use a special sponge shaped like a bagel which is quite popular here. I love having this neon sign on my head declaring that I am an observant Jew and a lawfully wedded wife. 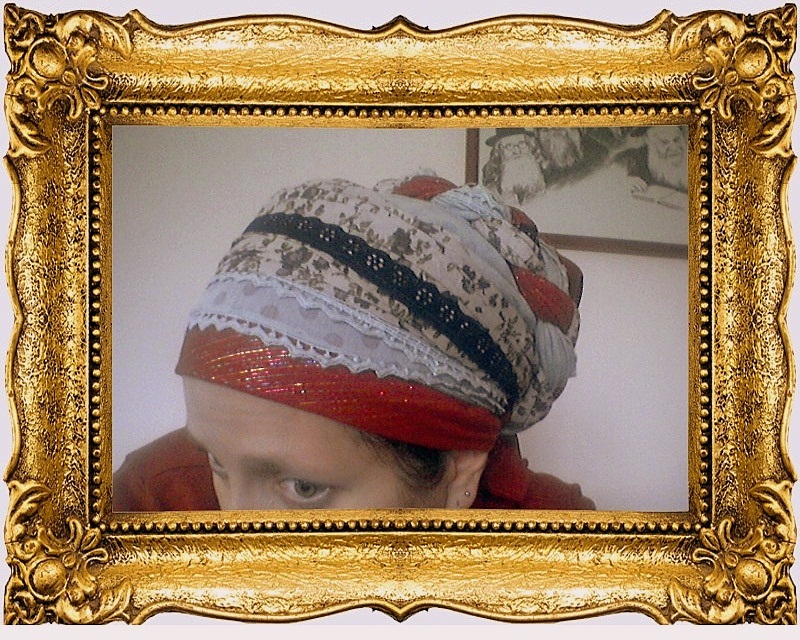 To me head coverring is as much a part of tzniut as wearing a shirt is. On a more materialistic view, I feel it help sme complete my outfit and make a match between garments that wouldn’t go together without it. What is your favourite way to wrap your scarves? 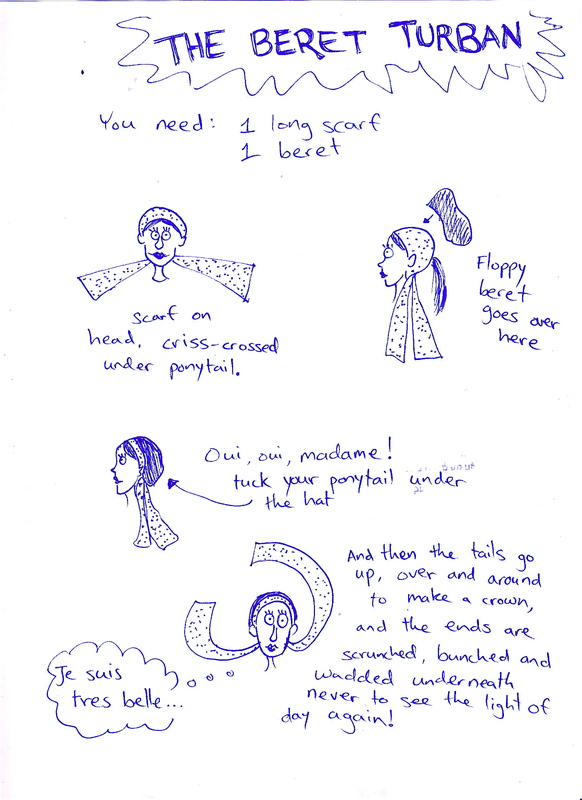 What is your favourite scarf/accessory? 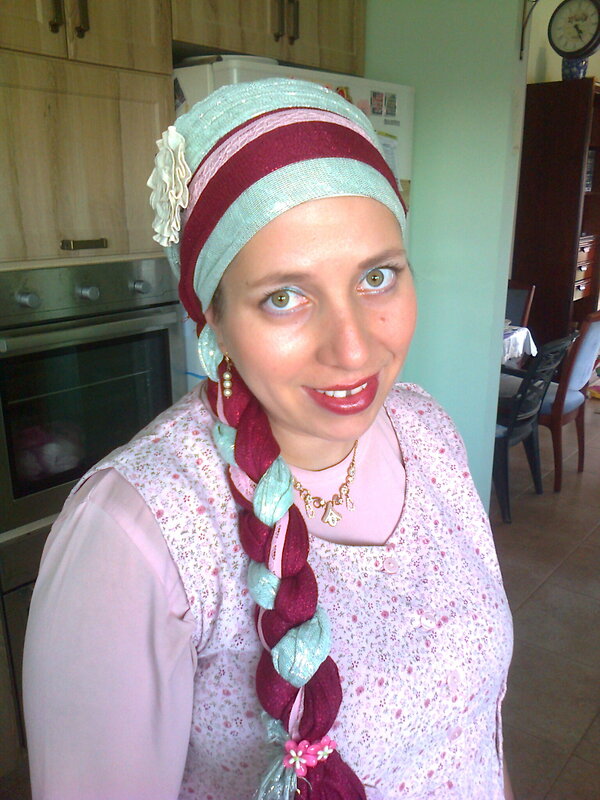 My favorite way is when I get a “chassidic” look, with a lot of volume – like the Breslev women do. My favorite scarves change from time to time, but it is always an item which I like for being comfortable more than the colour or any other criteria. I have many accessories and I also make some (such as the brooch on the pink-and-gray do photograph). I don’t know if I have a favorite, but there are some I wear often like the bobby pin with the creamflower on the mint green-and-maroon look. I haven’t gotten dressed yet, so I am still wearing the dark green berret I sleep in. Do you have any stories (funny, meaningful) you would like to share about hair covering? Before I gave birth 4 months ago, I had a serious discussion with a friend about what to cover my head with in the delivery room. 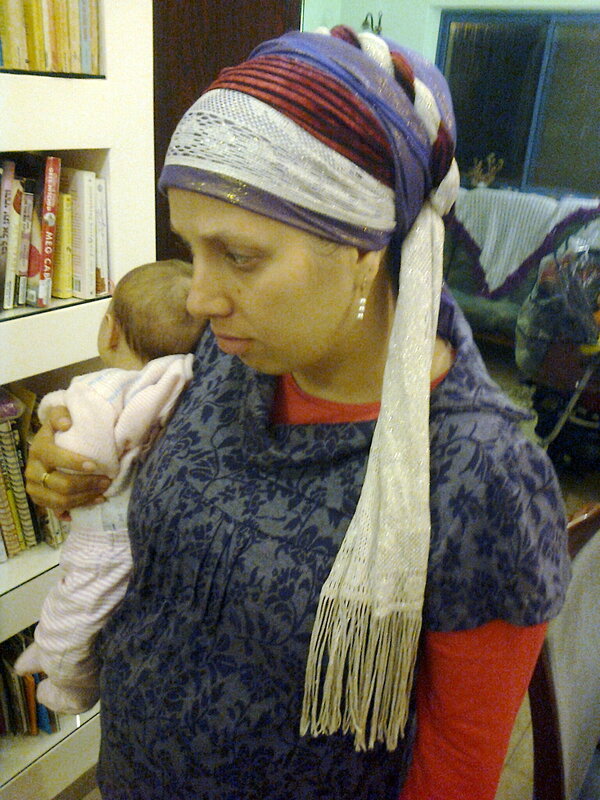 We decided on either a berret or a snood (I love charedi snoods – very lite and comfortable) or a very comfy tichel. When the time came it was shabbat morning, and I couldn’t stand the thought of getting in the ambulance in plain clothes. 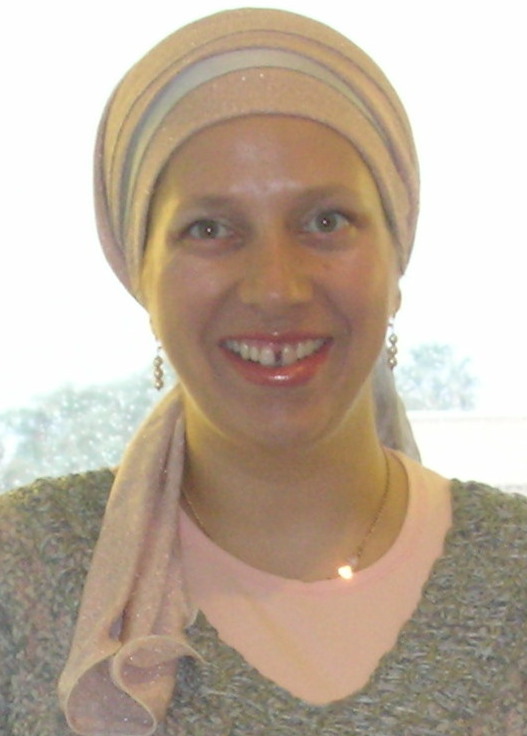 So I put on a shabbat dress, tied a sparkly shabbat tichel with a lace ribbon and got on the ambulance. I only changed in the delivery room. I am grateful for the biggest treasures Hashem has given me. A lovely supportive kind-hearted husband, and my two beautiful daughters, aged seven years and four months old, and for the being a stay-at-home mom. I am grateful for the lovely house we have built recently in which we live, and for our loving families and friends. Thanks for giving me this opportunity for self reflection. It was very interesting. Have a lovely day! !